With the discovery of gold in Western Montana in 1862, it became apparent that as direct and safe a route as possible must be opened from the east to allow freight emigrants to reach the new booming goldfield communities. 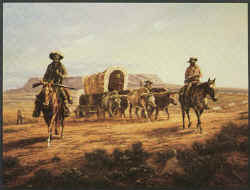 The capable frontiersman, Jim Bridger, assumed this task in the spring of 1864 and guided sixty-two wagons from Fort Laramie, Wyoming northwest through the Bighorn Basin, which, because it was not part of the Sioux hunting country was a much safer route than the trail proposed by John Bozeman, which traversed the Indian country east of the Bighorn Mountains. After guiding this wagon train safely into Virginia City, Montana, Jim Bridger retraced his route to Fort Laramie to guide a second wagon train across his 510 mile route to the same destination arriving in December. After the year 1864, this route known as the "Bridger Trail" was only used occasionally due to the lack of water and grass, but this trail and the man for which it is named have indelibly left their mark on the pages of frontier history.